What a better CSA based dish to bring to a Fourth of July party than a salad! With the produce items we will be receiving this week, there should be plenty of salad ingredients for a wide range of types of salads. Here are some of my new and old favorites. In the meantime, some of you have asked about fennel. I am linking you to a past post on fennel that includes three recipes, one a fennel and snap pea slaw that would be perfect for the holiday (click here). I’m sending this post out a bit early so folks can potentially use it to help plan their Fourth of July feasts. I created this first salad specifically for this Fourth of July. I had some beets from the farm and couldn’t get the idea of making something red, white and blue out of my mind. So I came up with my Firecracker Beet Salad with Blueberries and Honey Yogurt. It is as delicious as it is beautiful. Preheat the oven to 400℉. Place washed but not peeled beets in a baking dish. Place about ½” water in the dish. Cover tightly with foil. Place in oven and bake until beets are tender and a knife goes easily through each one. Remove from oven. Remove foil and allow to cool. Peel beets. Mix yogurt, honey and water together in a small bowl until smooth. Slice beets about ¼” thick or thinner. Arrange in overlapping circular pattern on a platter. Arrange blueberries evenly over beets. 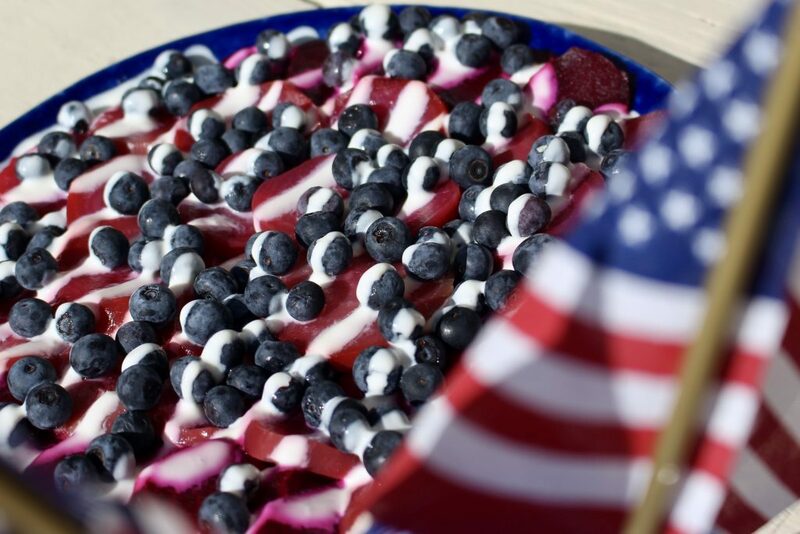 Drizzle yogurt dressing over beets and blueberries in a flag pattern. Serve. Another salad recipe I came up with this week is a delicious way to use up those snow peas (or snap peas, if preferred). It uses black, or Forbidden rice, an ancient whole grain rice known for its nuttiness and its anthocyanins, antioxidants believed to be important for longevity, heart health, and Alzhiemers and cancer prevention. Forbidden rice can be found at Whole Foods. some supermarkets and health food stores. If you can’t find black rice, you can sub in brown rice. 1 Bring 1 3/4 cups water and a pinch of salt to boil in a medium saucepan. Add rice. Bring to a low simmer and cover. Cook for 25-30 minutes or until water has evaporated. Remove from heat and allow rice to sit for 10 minutes. Uncover rice and allow to cool to room temperature. 2. Bring a pot of boiling salted water to boil. Add snow peas and cook for 1 minute. Drain and rinse immediately under very cold water until cold to the touch. Cut snow peas into thirds. 3. To make dressing:Blend all dressing ingredients. (you can also place in a container with a lid and shake). 4. Mix rice and snow peas.Pour dressing over mixture and stir to mix well. 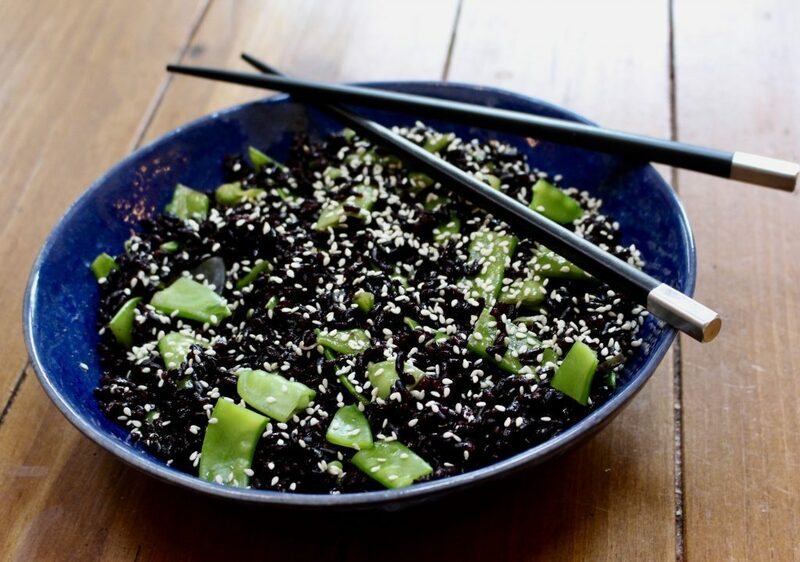 Place in a serving bowl and sprinkle with sesame seeds. Serve at room temperature or chill before serving. I hope you aren’t yet getting tired of kale. One of my favorite ways to eat kale is this light but tasty Kale Caesar Salad. Make your own croutons and I guarantee this salad will beat out any restaurant kale salad in the state. Place kale in a large bowl. Drizzle olive oil over kale. Using both hands, rub kale leaves between your fingertips, working your way through all the leaves, over and over, for about 4 minutes, or until kale looks darker, softer, and loses almost half its volume to wilting. Add dressing to taste and toss to coat. Add Parmesan cheese and croutons. Toss. Serve. Mix all ingredients. Season to taste with salt and pepper. If you have a spiralizer, this salad is hard to beat. It is a tremendous fan favorite. Just make sure to toss it with the dressing right before serving so the zucchini doesn’t water down the dressing. If you don’t own a spiralizer, you can make a ribbon salad by taking a vegetable peeler to zucchini and making long strips as you turn the zucchini. You can then stack the ribbons and cut them into smaller strips to mimic spaghetti. When ready to serve, toss zucchini noodles with cucumber, tomatoes, olives, scallions, and feta. Toss in vinaigrette to taste. Season with additional salt and pepper if necessary. Serve immediately. Using either a stand or hand blender blend all ingredients until smooth and emulsified. Refrigerate for up to 1 week. Want to make up your own salad with the wonderful lettuces we have been receiving? Try one of these delicious dressings with our beautiful farm herbs. Place all ingredients but dill in a container high enough to contain the long stem of a hand blender (like a tall ricotta container). Using the hand blender, blend vinaigrette until it is completely smooth and emulsified. Season to taste with salt and pepper. Mix in dill and stir or shake to incorporate it fully into the vinaigrette (you don’t want to pulverized it in with the blender). Alternatively, use a standing blender and mix in the dill afterwards.